So, I’m a Berkeley girl who decided to try Eminence Organic Skin Care to see what all the fuss was about. I’m almost embarrassed to publish this article, but I know there are other women (and men) out there like me, who might like to know about Eminence Organics products. If you are curious and want to learn more, read on. I was raised in Berkeley in the 70’s. My company was hired by Eminence Organic Skin Care to work on their Organic Farm in Hungary, and also the Eminence Kids Foundation, and through this experience, I spoke a few times with the owner, Boldijarre Koronczay. I have an amazing mom! When I first began researching the brand for our project, I let my skepticism be known. After all, I was raised to consider beauty products to be a bit of a fad. I was preparing to write a powerful post, titled “Free to Be, You & Me,” about how not to get swept up by beauty products that come in small bottles, and how it is all just a lot of hype. Isn’t it strange when something seemingly insignificant happens which then creates such an epiphany it changes you forever? Let me explain. Being raised in Berkeley in the 70’s has single-handedly had both the greatest impact and the greatest hindrance on my decision making. In the hippie culture and UC Berkeley environment where you were taught to question everything, I was raised from day one to look carefully at labels, seek out natural organic ingredients, and know how to identify fake advertising from a legitimate composition of ingredients. The benefit? As an adult conscious consumer, I now know better than most how to discern truth from fraud, accuracy from sneaky marketing, and slanted politicized propaganda from thoughtfully researched positive reputable reliable information I can trust. 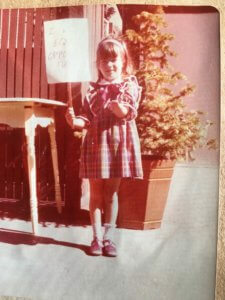 As a young girl, Berkeley was utopia! My mom raised me as a single parent while simultaneously getting her PhD in City Planning from UC Berkeley (only the 3rd woman to do so). She was a new generation of powerful strong women, breaking ceilings for their daughters and sons to expand our sense of self and what was possible. It makes me want to cry when I think of how determined she was to make it easier for me to more freely pursue my dreams. Berkeley enveloped us both into this experimental community of goodhearted young passionate people fighting for a better life for all. But, there was a catch. Berkeley culture at that time taught me organic was good, but “feminine” was bad. Being raised as a girl in Berkeley during the Women’s Liberation Movement, meant that incredible high-quality products, like Eminence Organics, were good for their organic natural contents…. But, they fell into this category of feminine, high-end spa and luxury skincare products meant to keep a woman down… and therefore, I shouldn’t buy them. spa treatments, facials, cleansers, masques, treatments, moisturizers, anti-aging serums, concentrated oils, skincare products, perfumes, exfoliants, toners, mists, luxury hotels, flying first class, shaving or (gulp) waxing bikini hair, lipstick, any make-up at all, fancy big amazing weddings, massage treatments, high heels, fancy dresses, lingerie, letting a man open a door, asking for directions, mascara, hair treatments… You get the idea. I was encouraged to stick with practical products like Ivory Soap and Vaseline. After all, bar soap could clean both my face and the dishes. Vaseline could both moisturize skin and lips and lubricate machinery! Caption: Marlo Thomas narrating her famous “Free to Be, You and Me” story, “Ladies First.” There was no question who the villain of the story was! What does this have to do with Eminence Organic Skin Care? Everything. This article lead me down a rabbit hole of positive discovery, impressive revelations, and indisputable, respectable, and legitimately positive information. This company has such a heart and soul, and they continue to set a standard for community, support and integrity. The foundation of this company was built on the values I hold most dear, and I was impressed. I shared the Eminence brand with my mom. She was impressed. When Eminence Organics got wind of my condescending attitude toward luxurious high-quality organic natural products for the face and body, a package mysteriously arrived on my doorstep one day. No card. Just filled with products. The first thing I did – despite myself- was clap my hands with excitement. A gift is a gift! It was so much fun to receive, and the presentation was impeccable. Catching myself, however, I quickly returned to my skepticism. I rolled up my sleeves and began to go through each product and study its origins, its ingredients and its contents. They were going to have to fight for this organic and green savvy conscious consumer’s recommendation. Eminence Organic Skin Care not only impressed me with their products, they shattered my beliefs about treating oneself well, inside and out. Taking care of your skin and treating yourself well is not “feminine,” it’s simply treating yourself well. Quality is quality. Results are results. My skin felt completely different after Eminence touched it. It was soft, supple and glowing. I (and my skin) can be strong, powerful, and beautiful, at the same time. Every day, I begin my new ritual with the Stone Crop Gel Wash. I had never even heard of stone crop before, but I had been introduced to this photogenic plant from the Eminence Organic Farm in Hungary. It smells so fresh and unlike anything I’ve put on my face. And the Sour Cherry Masque…. Forget about it. I have to resist wanting to eat it, it feels and smells so good (I did actually taste a tiny bit!). Even my husband loves Eminence products! And now he follows my ritual, too! These products are so pure and highly concentrated, and their scent is so deeply subtle and nourishing – we both just love how each other’s skin looks and smells… organic and delicious! My face loves the extra attention, and…. I feel so good about myself and my skin. I feel like I’m both taking care of myself, and that I smell pretty. It has lightened up my attitude, and makes me feel lighter and gentler and… feminine. Take away: I’m only as limited as my own mind. Thank you Eminence Organic Skin Care, and thank you Boldijarre, for teaching me a life lesson…. And for making me feel beautiful. Have you ever felt limited by your beliefs as a child? Did you ever struggle as a woman between finding simultaneous beauty and power? 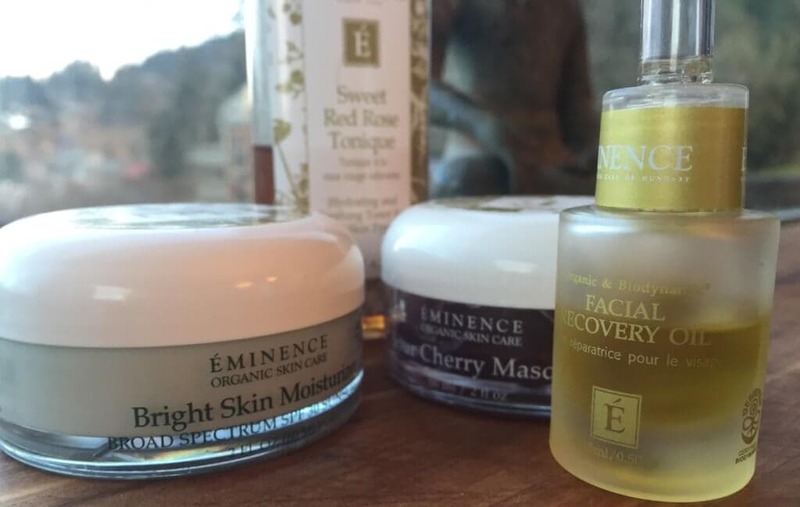 Have you tried Eminence Organic Skin Care yet? Are there other brands that you love – tell me about them! I just bought the brighten moisturizer online from the Johnson distributor two days ago and had used it yesterday. I like the product so far. However, I found one article online alarms the reader to be aware the products purchased online, because they could be fake. I like organic products. Do you know if Johnson is the distributor for Eminence? How can I tell if the product I bought was a good one. I spent $46+ for item ,so I hope I got a real one. First of all – I only use Coconut Oil. And I grew up with the opposite of a hippy mom!!! In the last 15 years I have leaned toward natural products and have tried multiple options, but the price doesn’t seem to equate with the product. And though I love smelling like a macaroon, your post has inspired me to try something new!!! Thanks for the inspiration and the laugh – love your humor!!! I love macaroons 🙂 It’s funny, whether hippie or not, the “rules” about how to be a “woman” run deep, don’t they? I think that is what has struck me most as an adult. I always believed that somehow because I was raised in Berkeley that I must naturally be more “easy-going” because that’s the stereotype. But, come to find out, it’s possibly MORE rigid in thinking! Both sides of the fence have strict rules about what to do or not do, what to believe or not believe… It’s been refreshing to question all of that. And, I love having friends with different backgrounds who help me learn and grow!!! Being a senior woman there are special needs to keep my skin fresh and nourished, found this and more in Eminence Organic skin care products. The Gel Wash, Whip Moisture, Strawberry Rhubarb Dermnfoiant, and Neroli Age Correctve Eye Serum are just perfect for my daily care, now that I have discovered Eminence Organic skin care I’ll not be without it. I found Eminence Organics about 7 years ago & will not use anything else! Wonderful organic skin care that really does help your skin be it’s best! Eminence Organics has products for all skin issues. I love the organic nature of all their skincare lines. It’s important to treat your skin on the outside with organic products as it is to consume them for internal health. Facial recovery oil is my favorite too especially after a post workout shower! I’m glad that you & your husband found them Greta! Eminence Organics is a great company that plants trees to help the world with her environment also! Yay! A fellow Facial Recovery Oil fan 🙂 I’ll have to try the “post-workout shower” idea! gleams with a glowing look. A great man founded a GREAT product. That is so beautiful, Angela. I just love how many women have shared stories of mothers, daughters, granddaughters sharing beauty secrets as a way of deep respect, honoring and love. LOVE Eminence Organics! Reading your blog, I heard some of my own thoughts echoed about the frivolity of beauty/skincare/spa/etc. from growing up but really – its all about taking care of your whole self – mind, body and soul! May sound cheesy but really rings true. Women constantly have to play the line between beauty and power – I’ve definitely felt that I wasn’t being taken seriously at times if I showed that I took care of myself when really its an investment in your health and wellbeing. Thanks for the read Greta! I think you nailed it, Marqui. To respect oneself intellectually without respecting the body doesn’t feel right. I think the intention was a good one as a child… Berkeley in the 70s was a reaction to a former time, but as an adult I can see now it is about balance. Celebrating beauty can be a very empowering thing, too! My older sister started using Eminence Organics for her 50th birthday & before long my friends thought she was my younger sister! I’ve had the pleasure to be able to get my hands on some of these fabulous natural skin care products and am enjoying the results! At 53 I just had my colleagues tell me how wonderful my skin looks! They’re in their 30-40s so it means a lot being the oldest one! I love love Stone Crop Anything, the coconut moisturizer, blueberry mask….. everything! Mmmm luxury for you! Personal Fave? Bamboo Firming Fluid- ahhh paradise for your skin! Love that they plant a tree for every product sold too! And help kids! Thx for the great write up and recognition for this best product line! Blueberry mask??? That sounds AMAZING. Thanks, Kathy, for your wonderful comment. I also love that Eminence Organics plants a tree. They are over 7 MILLION TREES at this point. I’m so happy people are recognizing this company for who they are and what they stand for. My older sister started using Eminence Organics for her 50th birthday & before long my friends thought she was my Younger sister! I’ve had the pleasure to be able to get my hands on some of these fabulous natural skin care products and am enjoying the results! At 53 I just had my colleagues tell me how wonderful my skin looks! They’re in their 30-40 s so it means a lot being the oldest one! I love love Stone crop Anything, the coconut moisturizer, blueberry mask….. everything! Mmmm luxury for you! Personal Fav? Bamboo Firming Fluid- ahhh paradise for your skin! Love that they plant a tree for every product sold too! And help kids! Thx for the great write up and recognition for this best product line! I keep re-reading your question regarding beauty vs. power. My mom is a feminist – and raised us to be one – but she always emphasized the importance of moisturizing and taking care of your skin; she and her mom used Vaseline as well, and in the 80’s my mom graduated to Mary Kay. She raised us with the belief that our body is a temple, and we should value it and protect it (hence, use skincare products). Thanks again for sharing, it’s a fantastic perspective that I never would have thought of! First, I LOVE your writing! You are really great at connecting with any audience, getting your message across and being witty at the same time. You are one of kind. I thoroughly enjoyed reading this blog post and every adjective you used; I felt like I was doing a meditation and was actually IN the spa. I love that anyone can treat themselves to this experience in their own home and by themselves. In my opinion, this is what beauty is about – making things happen for yourself and producing results that fill you with confidence and joy. When you feel good on the inside, it shows on the outside and you glow! Thanks for sharing this, I’m looking forward to trying their products! I love what you shared about confidence and joy, Laurie. You are so right. I think our parents were so passionate about making sure that “nothing got in our way…” so we could do and be anything we wanted. But, there is a quieter, softer ceremony of loving and honoring oneself inside and out. It’s funny, as an adult this may be the hardest thing for me to do! Things as simple as drinking water, stretching… and definitely taking gentle care of my skin. Making that an amazing experience, like I am having with Eminence Organics, feels like a real eye-opener. The idea of pleasure and delicate nurturing as a means of empowerment! Isn’t it amazing how even just a few dedicated minutes a day using Eminence Organics skin care products can make you feel so good?? It’s a form of meditation and expressing gratitude for yourself… and it’s healthy – because you’re taking care of your body’s largest organ! My grandmother used to share her beauty secrets with me… so sweet. And now, I can share my beauty secrets of my own! I can’t wait! I was just reading a book called ‘Uncertainty’ by Jonathan Fields that shared that one of the greatest tools for battling through the fear that holds us back is to create ‘rituals’ in our lives that serve as anchors … little moments throughout the day that help to ground us, and give us the foundation to grow in the midst of fear and doubt to become our most brilliant selves. It sounds like Eminence has created a lovely ritual in your day! I love this idea, Tania. You are so right. It’s the little rituals which ground us and provide a moment of peace in our day to reflect on what’s really important. Thank you for sharing! Brought up with the Boston feminists! Everything you say….yes! Love this! Cannot wait to try! 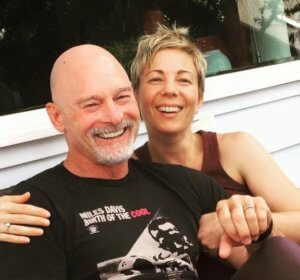 Thanks Greta–about to turn 50… sounds like a great gift to myself! Quite an excellent and heartfelt testimonial – I will definitely be researching and very likely eventually purchasing some of these products. Thank you for letting us know about them. You are so welcome, Tom! Not joking… Scott loves it. Let me know if you have the same experience! This is Greta’s Mom. I want one of those gift baskets so I can try some of these!!! It’s not the sixties any more — let me at ’em! !